Christine is three years old, but will turn four on Saturday. Eleven months ago, Christine was snatched from the arms of her mother by militants of Islamic State (IS). After that, the family was deported from their home town of Qaraqosh in Iraq. On Aug. 6, 2014 their home town of Qaraqosh was overtaken by militants of the self-proclaimed Islamic State. Khader Abada, the father of the family, is blind, therefore the family stayed in Qaraqosh, even after the takeover. They had no place to escape. So they were hoping for mercy for the blind and disabled from the terrorists. This hope was shortly destroyed. 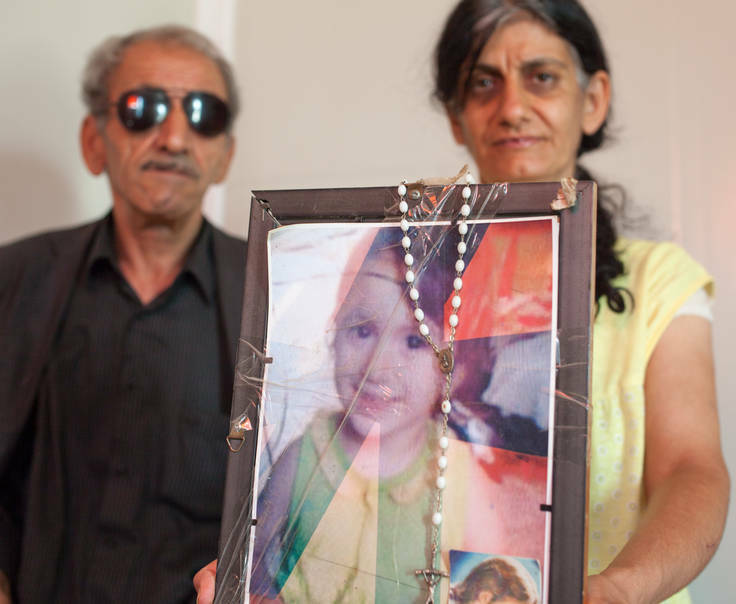 On Aug. 22, the family was taken by IS radicals for, what was said to be, a medical check-up. More Christians were brought together that day. Most of them had stayed in Qaraqosh for similar reasons as the Abada’s; because of handicaps, because of old age or because of other limitations that kept them from fleeing. The “medical check” proved to be a pretext in order to rob the families and subsequently deport them from Qaraqosh and cleanse the city. Ayda described the situation inside the building as very chaotic and a lot of walking up and down by IS fighters. She noticed that she was pointed at several times while holding her 3-year-old daughter close to her. The Christians had brought valuable belongings, some clothes and their ID cards. At some point they were said to take out gold and other valuables. The IS fighters took them. In the chaotic situation however, they did not take Ayda’s valuables. Subsequently, they were ordered to get onto a bus with the windows covered with dirt to block the view outside. Ayda held Christine in her arms, very close to herself. Ayda ran after the man who was called “Fadel,” begging him to return her daughter, but he did not listen. Christine was taken back into the building. Several times Fadel walked in and out. Ayda pleaded and cried for the return of her daughter, but he would not listen. Suddenly an older, heavily-bearded man stepped out of the building, carrying Christine in his arms. He appeared to be the leader of the gang and was called “the prince.” Christine was crying. Ayda was crying too, still begging for her return. “The prince did not say a word, but only looked at me and made a despising gesture with his arms like he was saying get out of my eyes,” recalls Ayda. The bus drove off. All the time Ayda kept looking back, desperately hoping to get a glimpse through the muddy windows and see her girl coming back. Every time when the bus would slow down or even stop, her hope increased that Christine would be returned to her any minute. But it did not happen. Now, 11 months later, Christine’s eldest brother is getting married. During the past 11 months the family and their church have made many attempts to get Christine released, or at least to learn more about her location. However, there is nothing known about her situation; not where she is or if she is even alive. Like other families in a this refugee camp, the family is receiving regular support from Open Doors through the church and local partners in the form of food bags and items for cleaning and hygiene. Help feed an entire family for a month for just $50.